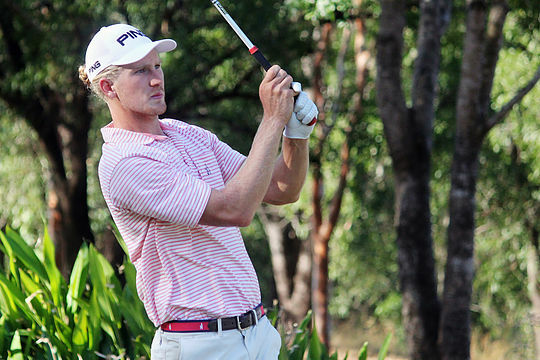 New South Wales Amateur Travis Smyth arrived in the Northern Territory fresh from a hot summer in the United States. Making the quarter finals at the U.S. Amateur, Smyth is in excellent form with his prodigious talent on full display at Palmerston Golf Course today for the first round of the Northern Territory PGA Championship. Playing in the afternoon field Smyth played a flawless round of golf firing 7-under 64 to lead the tournament by two shots. “Golf is a great game when you are playing well, I am enjoying it at the moment,” said Smyth. The 22-year-old thanked defending champion Jordan Zunic after his 64, the pair played a practice game together to the advantage of the first round leader. Sitting two shots behind the amateur are season Professionals Max McCardle and Neven Basic, playing in the same group the pair fired rounds of 5-under 66. A regular visitor to the Top End, McCardle utilised his course knowledge making the most of the opportunities that came his way. “I have some relatives here on my fiancés side…I am quite familiar with the course; I have played here quite a lot over the past six years. I have played it in all different conditions and have different strategies to try and attack the course,” added McCardle, who described his round as boring. While Basic was making birdies on course this morning, he started his week in the Northern Territory by catching fish. “I actually ticked something off my bucket list which was to catch a mulloway, a jewfish, I managed to get two of them so it just set me up for a really good week,” said Basic. After a slow start to his round, Basic was back on track with a birdie at the par-4 6th hole and rode the momentum for the rest of the round. “I finished birdie, birdie which is always nice. I got off to a bit of a dodgy start, I was 1-over after three and I started hitting some good shots and making some putts,” added Basic. On 4-under the card and rounding out the top-5 after the first round are; Deyen Lawson, Josh Younger, Andrew Schonewille and Darren Beck.